As we head into our final weeks of our 4-5 week trip - LOL - now weeks 7 & 8, our last day of the Easter Break we left to head towards Bathurst. I have a few camps chosen and the first one at Bathurst was ok, but not ideal. 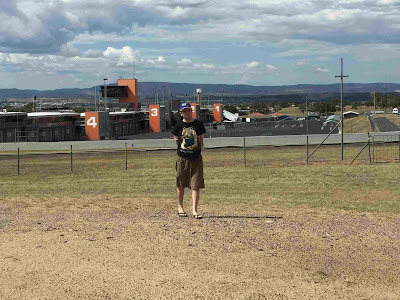 We went to Mount Panorama as Jonnie wanted to see the track. We found an open level space and un-hitched the van. Peter and Jonnie did a couple of laps @ 60 km, and I did some sewing. Hitched up again we went to the second free camp on the other side of Bathurst and there were still so many vans there, so we kept going. We ended about 50 km out of Bathurst at Lake Wallace, Wallerawang. This has to be one of the best free camps – and it is free, not donation. There is a lot of open space along this side of the lake. One amenities block with hot showers, plenty of bins and a dump point. In 1836 Charles Darwin visited the area and stayed at the Wallerawang Homestead – not in the middle of the lake – and observed platypus. To this day I have never seen a platypus in the wild. It's over 35 years since Peter and I have been to the Blue Mountains and some things have changed – the roads are much better – and some things remain the same. The first crossing of the Blue Mountains was in 1813, and the road to Lithgow, about 10 minutes from Lake Wallace, was built in 1815 as the lands around was being settled. The area was the traditional home of the Wiradjuri people, and there are over 400 Aboriginal sites in the area. We stayed three nights. 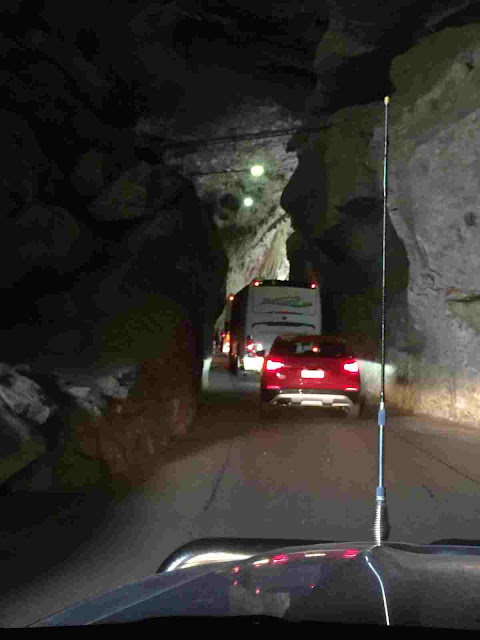 One day Peter and Jon went to the Jenolan Caves $40 per adult. Other campers were also going and they had booked, so we booked also. It is about a 45 minute trip from Wallace Lake, depending on traffic. It took Peter and Jon a little longer as someone 'came up the down road' which stopped the traffic. As the road is narrow, there are certain times for going up or down. The mornings are mostly down. After lunch they toured the Lucas Cave. We also spent a day exploring the Blue Mountains. The Blue Mountains got their name by the blue colour the mountains look from a distance. The 'blueness' is enhanced by the large number of eucalyptus oil droplets released by the gum trees. The mountains were formed about 170 million years ago when volcanic forces below the earth forced the rock strata upwards. The caves, valleys and cliff faces have been formed by the weathering of the softer shale and coal rocks. 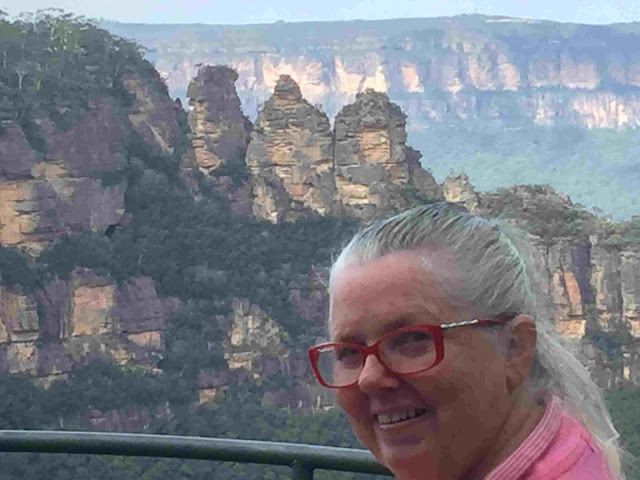 We drove to Echo Point and the Three Sisters first – a magnificent view and heaps of tourists. Later in the day we found a better view of the Sisters from Eagle Hawk (below) along the scenic Blue Mountains drive. According to Dreamtime Legend, three beautiful sisters, Meehni, Wilmlah, and Gunnedoo, were in love with three brothers from a different tribe. The brothers decided to kidnap the sisters and a tribal war took place. The Kuradjuri (clever man) turned the sisters into stone with the intention of turning them back after the war. Sadly the Kuradjuri was killed in the battle and the sisters remained stone. 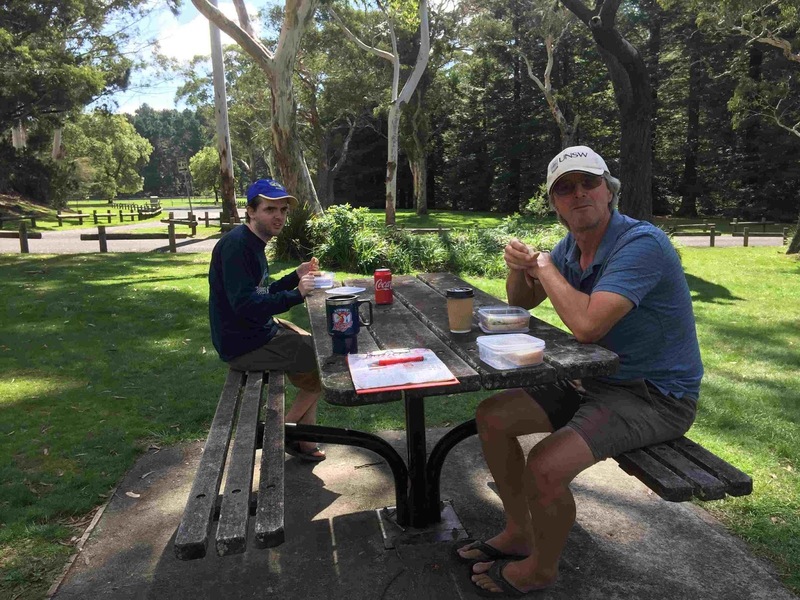 We had lunch at the Katoomba Falls park which was lovely. Heading back to Lake Wallace we pulled up at the famous Hydro Majestic. I would have loved a high tea there overlooking the valley, but at $55 each it was well out of our budget. 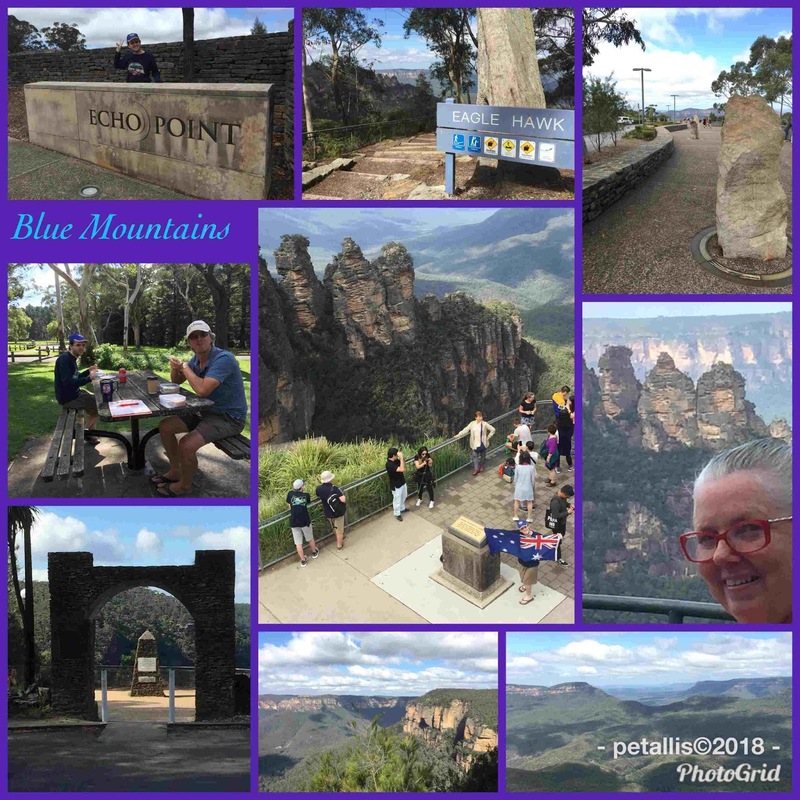 We stopped at Govetts Leap at Blackheath to look at the views over Grose Valley. There are some short walks from here and covered picnic tables. A bit of trivia -Joseph Cook, Prime Minister of Australia 1913 - 1914, lived in Lithgow. His story is an interesting one - Google it 😊. If one has never been to the Blue Mountains a ticket to Scenic World is a must. It includes two cable car trips to see the magnificent views of not only the Three Sisters, but the whole valley; a steep train ride down the mountain; and many many walks to and from the rides, including an abandoned mine with recreations of a miners hut. We woke up the next morning to the fridge not working, so after a few phone calls it was decided that we needed power to top up the batteries. I guess it didn't help that we spent the last few days under the shade of trees and over Easter we let Jonnie play Playstation – because the batteries were full. Guess the batteries needed more sun to top up. So anyway, we needed to have power for at least one night. 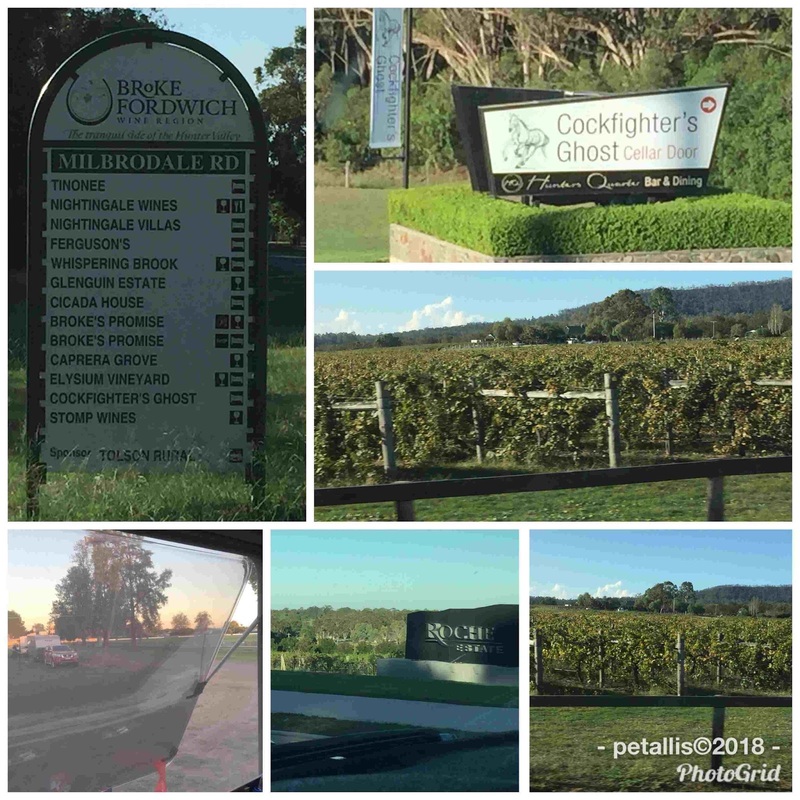 We were going to stop in two different places on the Putty Road, but decided to go the whole of Putty Road to Cessnock in the Hunter Valley. We left Lake Wallace and promised we would return to explore some more. We checked with the info centre to make sure the roads we planned going on were ok for caravans, and headed along Bells Line Road, past the old Zig Zag Railway to Kurrajong. We should have stopped at the Zig Zag Railway, but as we were now travelling further than we had originally planned, we thought it better to keep going. 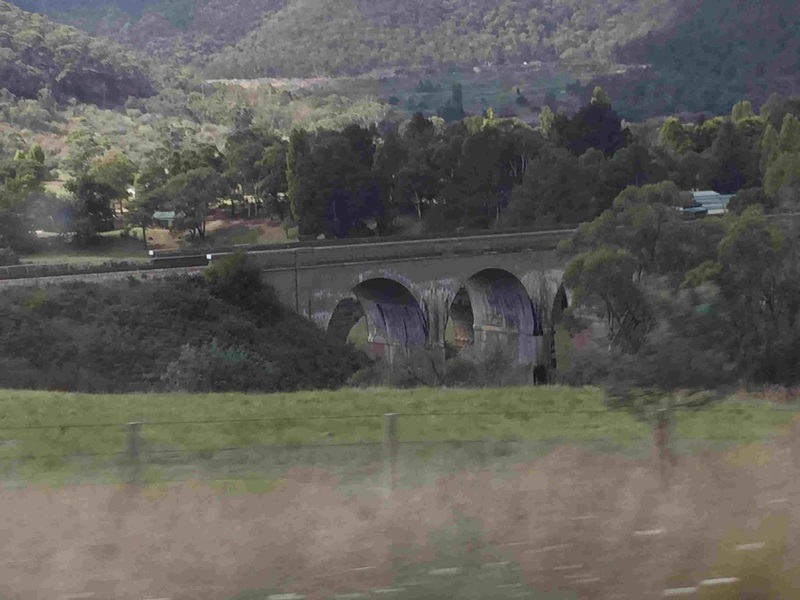 The Zig Zag Railway was opened in 1869 and it zig-zagged along the edge of the Lithgow Valley. Interesting place, a definite place to visit next time. One of the many arched viaducts along the old Zig Zag Railway. The views were amazing, sadly not many places to stop and look. We reached Kurrajong, and to cut out some of winding Putty Road we headed up Comleroy Road – very scenic. 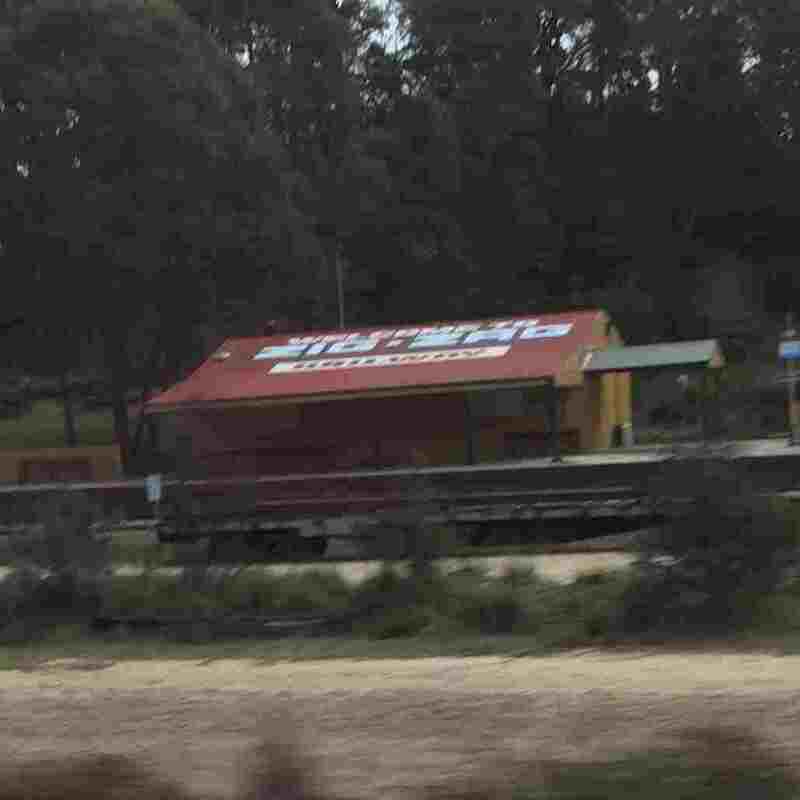 Turning onto Putty Road, the next stop was Grey Gums Cafe. This is where we had planned to spend the night, and it is certainly a great 48 hour stop over, with great food (and big servings) at the cafe. We had lunch and a break for Peter – we had been driving for almost three hours – and back on Putty Road. We had planned this part of the trip so we would not be on Putty Road on the weekends as the road is a haven for motor bikes on the weekends. Turning off and heading towards Broke, we saw many signs for an Italian Festival at Broke in two days time, but when we got there, there was nothing – strange. Continuing on to Cessnock, past many wineries, some of which we intended to visit the next day as we were staying two nights in Cessnock. WELL, when we got to the showgrounds we both said “oh no” - it was packed all around the grounds. Obviously something on. We went next door to the caravan park and they were also full – and very rude! So we kept heading north to Singleton and got the last power and water site $25. The Singleton showgrounds are quite good, and not too far from Cessnock, but we decided only to stay one night and keep heading home. Jon is keen to get home now. 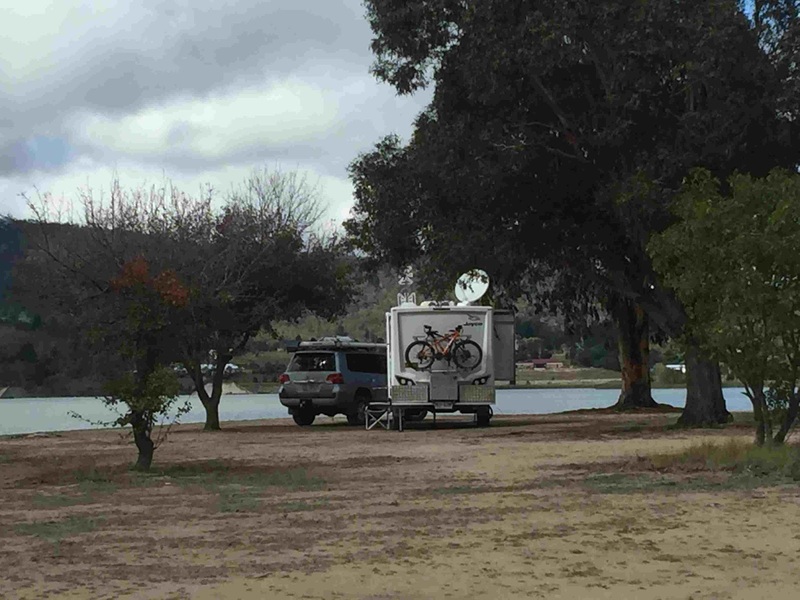 Left Singleton and arrived at Wallabadah First Fleet Memorial RV camp for lunch, and decided to stay rather than head to Chaffey Dam. So lovely here. Jonnie had a look at the memorial. This is a $10 donation camp for 1-3 days. Water is available and toilets and hot showers. We have been here a few times before, but it was the first time for Jonnie. The next day was another longer drive than we usually like, but as the boys were keen to get home we skipped a few good camps. We often stay in Mother of Ducks Lagoon free RV camp at Guyra. It is situated on a golf course and the across the road from the sports club. We always have dinner at the club when we stay here, and this time was no different. There was a wedding function going on so the food wasn't as good an usual, but still good for the price. The next morning there was a knock at the door and a man wanted to ask a few questions about our van. It was so sad. He and his wife had picked up a new (bigger than ours) Jayco Silverline van from Coff Harbour Jayco during the week. This was their first trip after retiring and yesterday his wife died!!! So sad. So he now wants a smaller van just for him. I hope Coffs Harbour Jayco do a good deal for him. He still seemed to be in a daze after the death of his wife. So sad - this is why we do as we do. Enjoy life NOW, one doesn't know what tomorrow brings. 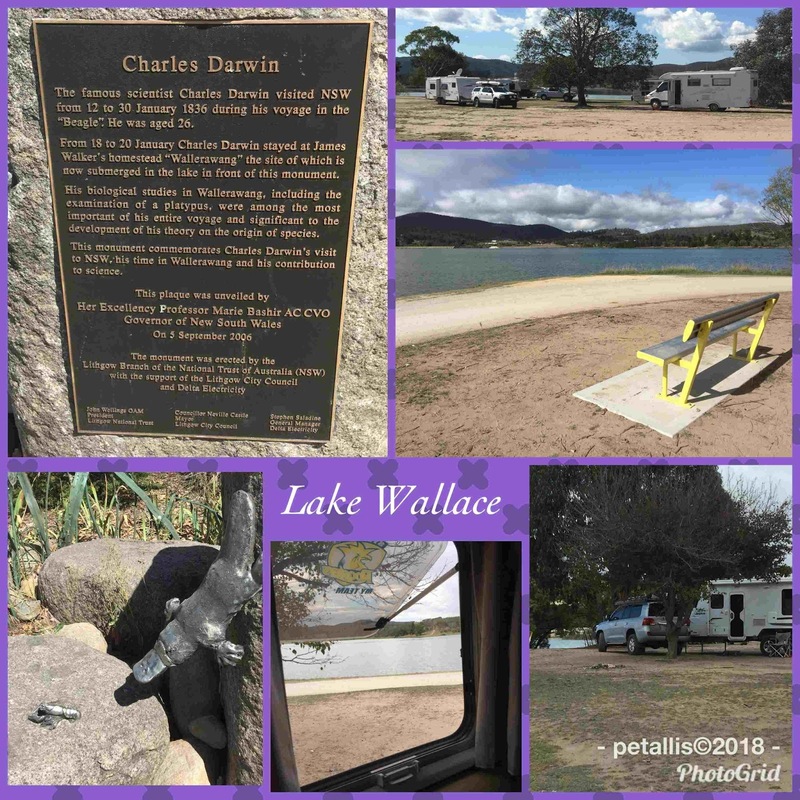 We had another long drive to the Queensland border and Wallangarra Lions Park. This is a free park, but since it was school holidays the Lions Driver Reviver was open so we left $10 with them as a donation. This is another park we often stay at overnight as home is a three and a half hour drive. We had a great time, and yes, it was a lot longer than we had planned but that happens, and it was perfect. Jon wanted to see some places that we may or may not have gone to, but we did and we liked them. Now to plan the next big trip to Central Australia - I wonder what Jon will want to see there! So interesting to read about your trips.